Lincoln-Sudbury starter Jacob Pullen threw five innings of one-run ball. Andover, Mass. - Lincoln-Sudbury can finally come in off the ledge. After an auspicious 0-3 start to the season, one had to wonder if the Warriors’ season was in danger to be over before it even began. For the time being, such thoughts can be pushed aside. 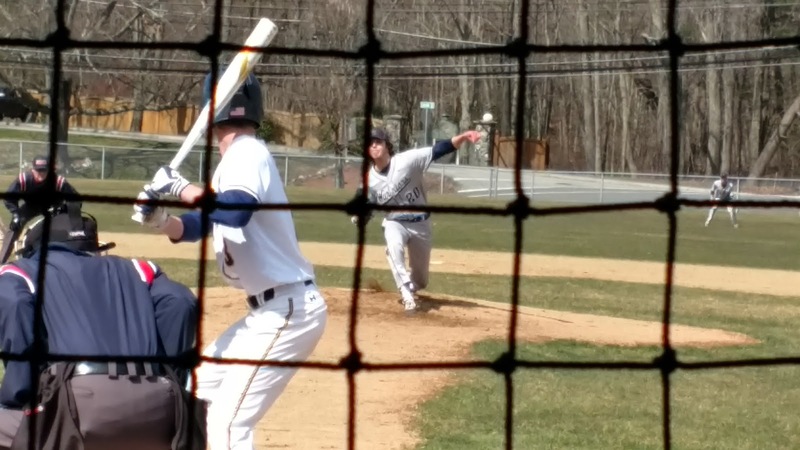 Behind some stellar pitching and timely at-bats, Lincoln-Sudbury did just enough to slip past Andover, 3-2, on Friday afternoon at Peter Aumais Park. Finally getting in the win columm, the Warriors (1-3) seemed to have a new outlook on life. Having beaten such a formidable opponent, L-S certainly has every right to believe it may have turned its season around. "That is, by far, the best team we have played this year," said Warriors’ coach Matt Wentworth. "I thought their defense played fantastic. We had a couple of balls hit that I thought would get through but they were stopped by them. No doubt this was a big win for us at a crucial time." The Warriors fell behind early but scored single runs in the third and sixth innings, respectively, to stay one step ahead of the Golden Warriors. Starting pitcher Jacob Pullen, after a rocky opening frame, settled down very nicely before passing the torch to reliever Keith Schmelter to begin the sixth inning. Following some tense moments in the sixth, Schmelter was able to dance his way out of danger to record the save. "In the past couple of games we have had some trouble getting the ball over the plate which has cost us," Wentworth said. "So to have (Jacob) Pullen and (Keith) Schmelter pitch seven strong innings, like they did, was really good to see today. Jacob is a mentally strong kid who knows how to pitch." Pullen, a left-hander, allowed just one earned run on two hits and fanned six. The senior continuously used the inside half of the plate to his advantage as he continued to hold the Golden Warriors (1-1) in check. "I just let the energy of my teammates carry me today," said Pullen. "I just went out there and tried to throw strikes and was able to get outs. As I gained some confidence I started to roll. This win was huge for us. Going forward we now have some momentum. It certainly helps when you beat a great team like Andover." Having already had four games postponed due to inclement weather, the Golden Warriors managed to pounce on L-S right from the get-go. A lead off walk to Patrick Dennehy led to see the senior crossing the plate moments later following a wild pitch that put Andover on top 1-0. L-S retaliated to begin the second inning. Jake Madden opened with a single against Golden Warriors’ starter Josh Gruenberg. Two outs later, with Madden standing on third, Schmelter legged out an infield single to tie the score. The Warriors (6 hits) took the lead in the home half of the third. James Dillon smashed an opposite field, one out triple to right and scored a short time later on a passed ball. Pullen, now appearing to be in full control on the hill, set down Andover with relative ease over the next two innings to keep his team in front. But in the Golden Warriors' fifth, trouble loomed. No. 9 batter John Metzamaekers started things off by lining a triple to right. The ball was temporarily bobbled by right fielder Matt Perricone, which allowed the speedy senior to sprint home to knot things at 2 apiece. L-S, however, returned the favor in the next frame. 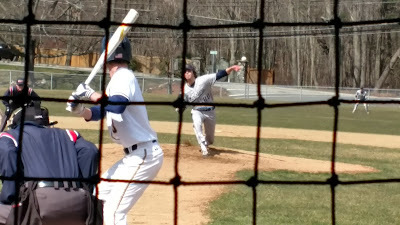 Junior Andrew Theriault came on in relief of Gruenberg and proceeded to strike out Perricone. Perricone, however, managed to reach second base following a wild pitch and a throwing error. After Perricone moved over to third on a SAC bunt, the senior scored on a deep fly off the bat of Milind Lele to put the Warriors ahead to stay. Schmelter came on in relief and evaded trouble in the sixth, but after the Warriors went down quietly to start the seventh, Andover, which finished with three hits but struck out 10 times, made things a bit interesting in the bottom of the inning. With two outs and nobody on, Gruenberg walked and Cedric Gillette reached on an infield error. Schmelter regained composure, however, and came through wit a key strikeout to seal the Warriors first win of the season. "It was a good game and L-S is a very good program," Golden Warriors coach Dan Grams said. "They are certainly better than their record. For us, I feel that we are only going to get better. When the weather gets better I think we will start to hit the ball better. Today, we didn't really make any adjustments after that first inning. I thought we relied on too many close pitches in which we we ended up striking out."